Just yesterday I saw it again on TV; the clip showing Luis Suarez weeping like a baby following Liverpool's collapse in the match against Crystal Palace. Under Brendan Rodgers in 2014 the Anfield side came agonisingly close to winning a first league title in the Premier League era. The Reds let a three-goal advantage slip to end the game 3-3 at Selhurst Park. But it was a must-win match. That draw, in addition to Steven Gerrard's famous slip meant Liverpool will fail to win the Premier League title after having a tremendous campaign. Suarez was off to Barcelona in the summer. Perhaps after scoring 31 goals in 33 league games, winning the golden boot and still falling short of winning the title he knew it was time to move on. The joy he has had at Camp Nou must have banished the pain a long time ago. He is now a proud winner of three La Liga titles, the Club World Cup trophy, the UEFA Super Cup, four Copa del Rey trophies, and the Champions League. He has been a key player in a successful era for Barcelona. The Uruguayan partnered Lionel Messi and Neymar to rule Spanish and European football. And after the Brazilian left he has continued to match on with Messi. The duo won the double last term and may do even better this time around. Barcelona is already in the final of the Copa del Rey and hold a healthy lead at the top of La Liga table. With just eight games to go, we could say the title is already in the bag. I mean only a catastrophic collapse can prevent the Catalan side from claiming another league title come May. Fortunately, unlike his previous club, that is not in Barca's character. Real Madrid may have held Europe hostage in the last three years winning the Champions League back-to-back-to-back, but as far as domestic football is concerned, the Blaugrana holds sway. Five straight Copa trophies and several league titles in the last decade tell it all. But the man at the centre of it all has been Lionel Messi. The Argentine magician pulls a new trick from his ever full bag of tricks week in week out to keep the football world stunned. It's so much that even opposition fans give him standing ovations. In the midst of this, Suarez runs the risk of being a forgotten man. I mean what could he possibly do that will trump his captain's mesmerising output? Be it goals, assists or Man of the Match performances, Messi is untouchable. Comparing Suarez to Messi is like comparing a mere mortal with a supernatural being. Yet, the four-time Ballon d'Or award winner cannot do it all alone. He still depends on the other members of the team pulling their weight for the team to stay at the top. Suarez is first in line in that regard. 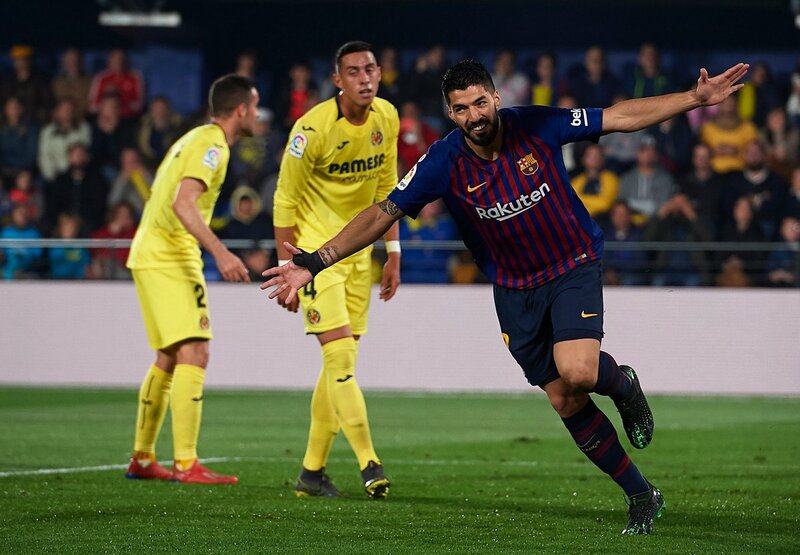 The midweek fixture against Villarreal proved as much. Manager Ernesto Valverde decided to rest his talisman for the game as the Champions League double-header against Manchester United approaches. Things started out very well as the Messi-less group ran to a 2-0 lead in the first 16 minutes of the match only for the home side to pull one back in the 23 minute through Nigerian winger Samuel Chukwueze. No one expected what was to happen in the second half even with the Barcelona talisman now on the pitch. Villarreal scored three more times in the 50th, 62nd and 80th minutes to turn the game on its head. Messi and Suarez then took over. First, the Uruguayan drew a foul from Alvaro Gonzalez in the 86th minute that attracted a red card from a second yellow. Now with the man advantage, the Blaugranes turned the screw. Unrelenting pressure led a the home team conceding a free kick at the edge of the penalty box. Messi blasted it home to bring the score to 4-3 in the 90th minute. The Barca #9 finished the job in the third minute of extra time to preserve a five-month unbeaten run. That may just be the game that seals the league title win this season as second-placed Atletico Madrid will find it difficult closing an eight-point gap with eight games left to play. Emmanuel is a freelance football journalist who lives and breathes the round leather game. He is a contributor on several platforms. You can follow him on Twitter for more. Is Lionel Messi holding Barcelona's future hostage?